After the FUJIFILM’s breakthrough research in Nano-technology and collagen, ASTALIFT is known for it's revolutionary beauty and skincare solutions. 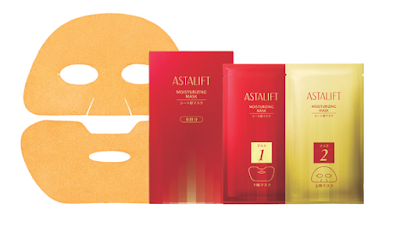 And now FUJIFILM is to announce a new addition to the ASTALIFT skincare series, say hello to the ASTALIFT Moisturizing Mask, as well as two limited edition products, ASTALIFT hand cream and body cream. This is a two part mask that's made up of highly elastic material which stretches in all directions so it'll sit perfectly on your face, giving all the contours and creating immediate lifting effect to your face, while delivering intensive hydration in 10 minutes. The hand treatment to hydrate hands especially in dry air-conditioned environment. It's formulated with the same ingredient as the mask, Astaxanthin and three types of collagen, so it will not only hydrate but also plump up the skin, enhancing the suppleness. Both of the cream is damask rose-scented and the body cream is ideal to use on arms, legs, elbows and heels too.